I’m on the train the other morning juggling the New York Times on the IPad and dealing with these Texts that keep coming in over the transom and spy something green, my favorite color, over the top of the screen. A Praying Mantis is crawling up my leg during my morning commute. I check it out, take a few pics, pick it off my leg and put it back on the floor. And it crawls right up again for some quality time. So now I have to reciprocate, I suspect it is a her; but that may just be my neediness for female company. 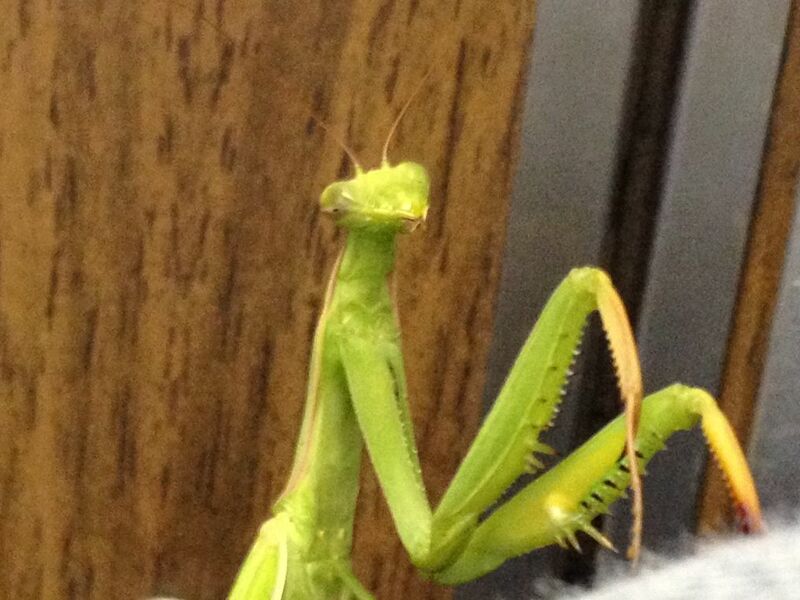 I wonder if there is anything totemic about a Praying Mantis. I wonder why any of the 3 people seated immediately next tom me aren’t looking- maybe they think this is some weird pet I’ve pulled from my pocket. Sure Why Not? Too bad I’m no longer hustling Hippie Chicks.